Tampines One Shopping Mall opened its doors to the public last Friday and my Dear and I have visited it on the 2nd day of its opening (see my blog post on that day). 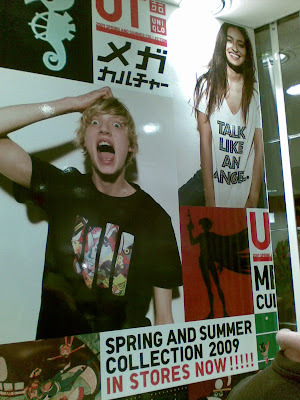 As I have mentioned, there is nothing fantastic about Tampines One, except for the flagship shop called Uniqlo, which is Japan’s No.1 casual wear brand in the mall. 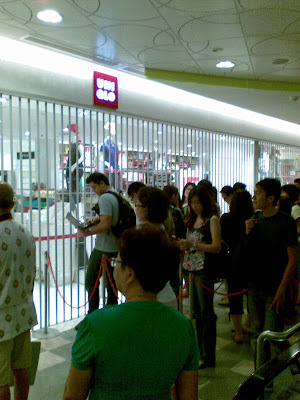 My Dear and I could not get into the store when we visited Tampines One last Saturday as there was a ceaseless queue of shoppers waiting to enter the store. This morning, we went to Tampines One for the second time and thinking today, being a Friday morning, we would sure have an opportunity to visit the store and discover what is so fascinating about it. 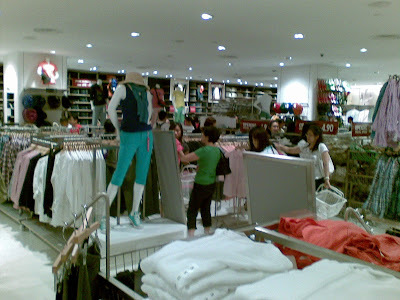 Just before we reached the store, we already saw a queue forming up at the entrance of the store. We checked the store and realized it would open its door only at 11 am. We were amazed that the time being 10.30 am, a queue of people has already formed! We shopped around the other shops in the mall and made our way back to Uniqlo at 11 am. We joined the queue which has since grew longer. It took us 15 mins to enter the store as the store limits the number of customers in the store. 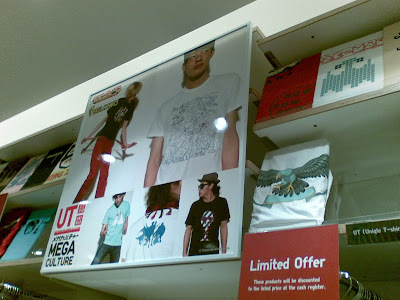 I find it unique for Uniqlo to limit the number of customers in the shop. In my opinion, I find it’s a brilliant business strategy as well! 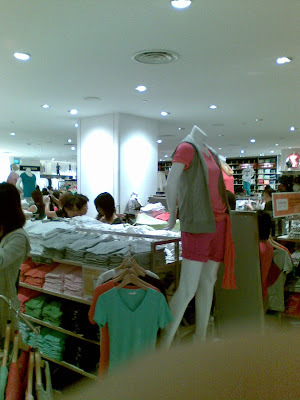 Firstly by limiting the number of customers in the store, Uniqlo is bettering the quality of the shopping experience of customers (as its not that crowded!) Secondly, by limiting the number of customers in the store, you are naturally creating a queue of customers outside the store, this in turns creates some buzz and free publicity for the store. 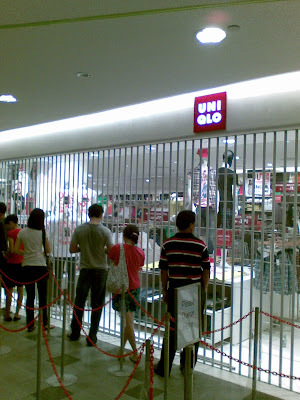 Singaporeans are always curious in nature and seeing people queuing up, they will inevitably queue up too to find out what’s really so special about Uniqlo (whether or not they will buy ultimately from the store).Last but not least, such a tactic will encourage customers to buy at least something from the store. 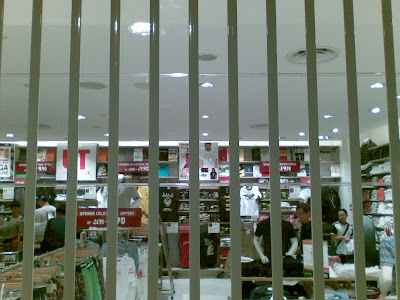 Having spent a great amount of time waiting just to enter the store, it is Singaporeans’ natural psyche to at least get something from the store they like (maybe not like that much) as entering the store for the second time is an uphill task requiring lots of time again! That’s my take for Uniqlo. My Dear and I spent just ten minutes to navigate the store and exited empty-handed for there is not really anything special about the products on offer there (at least in our opinion). In the newpapers today, I even read that a lady wrote to complain that she was turned away by Uniqlo though she has turned up at 845 pm and the store only closes at 10 pm. It may be just a marketing hype to say the least!